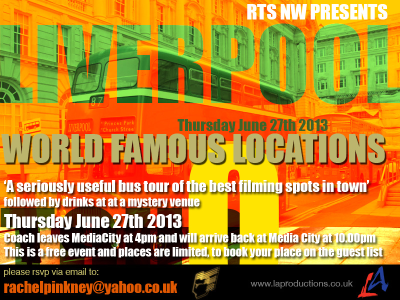 On Thursday 27 June, a coach will set off from MediaCity in Salford at 4pm to return at 10pm having engaged on a special mystery tour of 'world famous' film locations in Liverpool and a 'seriously useful bus tour of the best filming spots in town'. The evening will finish with drinks at 'a mystery venue'. 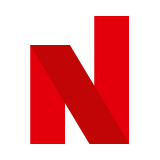 The tour has been organised by RTS North West in association with the Liverpool indie LA Productions and the Liverpool Film Office. With the increasing levels of new investment related to MediaCity, the three organisations felt the time was right to highlight the filmic strengths of Merseyside to an audience which might be otherwise unaware of the city's well-established filming credits. Over 100 hundred feature films have been shot in Liverpool with more recent credits including Christina Noble, Fast and Furious 6, Captain America: The First Avenger, Harry Potter and the Deathly Hallows, Nowhere Boy, Guy Ritchie’s Sherlock Holmes, Alfie, Salvage and Charlie Noads RIP.